You want to search for a specific email message, but search in Outlook isn't working. All features on the Search tab (on the ribbon) are greyed out, and when you hover over any of these features, a tooltip appears to tell you that it's not available. The problem may be that the Windows Search service either isn't running or isn't running in an optimal startup mode. If that's the case, Outlook search features will be unavailable. Use the following procedure to make sure the Windows Search service is available to Outlook. Type Services.msc in the Run dialog box, and then click OK. In the Services window, scroll to find the Windows Search service, right-click it, and then click Properties. 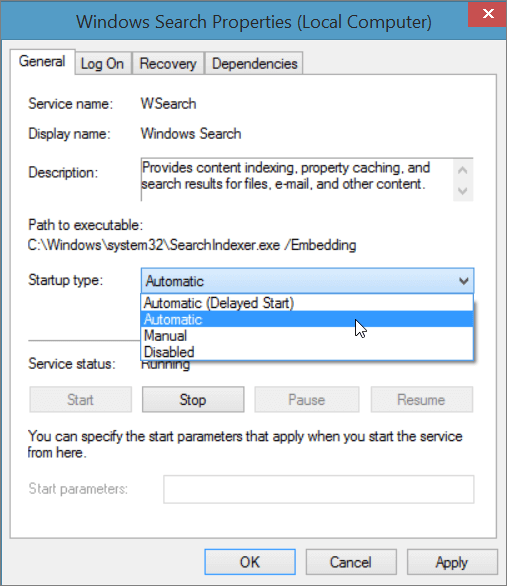 Automatic: Service starts immediately after Windows starts. Automatic (Delayed Start): Service starts shortly (for example, a few minutes) after the last automatic service has started. Important: The setting Disabled prevents the service from running. Open Outlook. Features on the Search tab should be available.